level of proection to Washington's goaltenders, and has been valuable in giving hits and blocking shots. OK, we all agree goalies are weird, with a few exceptions, but young defensemen are weird too, especially in their development. NHL history is replete with examples of young defensemen going bust with one club and becoming stars with another. Jim Watson was cut loose by the Boston Bruins and became a core member of the Philadelphia Flyers' 1974-75 Stanley Cup winners. The New Jersey Devils developed Sheldon Souray and Jason Smith, deemed others in their organization better, traded them for established players and watched them become leaders elsewhere. The Pittsburgh Penguins didn't see enough from Michal Rozsival before he injured his knee to stick with him through his comeback, nor did his next two teams, Trinec and Pardubice in the Czech league, before he signed with the New York Rangers and became a leader of their defense the past three seasons. Add Milan Jurcina, 24, to the list. 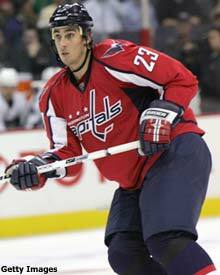 The 6-foot-4, 235-pound, right-side shooting Washington Capital played 91 games over two seasons for the Boston Bruins before being traded to Washington Feb. 1, 2007 for a fourth-round draft pick. "Coming here has been really good for me," Jurcina said. "When you're playing 20 minutes a game, your confidence goes up. You begin to believe in yourself and you want to show your teammates and coaches that you can play good hockey." You can't really blame the Bruins for missing a diamond in the rough. Although he was a draft pick from an earlier regime, Jurcina didn't excite too many teams at the 2001 Entry Draft when he was picked in the eighth round, 241st overall. He played three low-scoring years in the Quebec Major Junior League and two for the AHL Providence Bruins. No, Jurcina didn't create much excitement before playing in the NHL. In 2000-01 with the Halifax Mooseheads, Jurcina had no goals and five assists in 68 games. The “Q” is a high-scoring league where defensemen jump into the play and most wiseguys would tell you your grandmother can get five points by Halloween. He did post 20 and 28 points in two other junior seasons. Today, Jurcina has found a home in Washington, where the Capitals have shown a lot of faith in him. Jurcina is third on the team with 131 hits and is second on the club with 95 blocked shots. He average 16:48 per game. Basically, he gives the Capitals a big, strong defenseman with a huge puck-sweeping wing span. Few players in the NHL can overpower him and it's a long way around him. Jurcina doesn't do anything spectacularly, but he does core elements of the position competently and confidently. With the Bruins, Jurcina played 51 games for coach Mike Sullivan, a former defensive forward, in 2005-06 and 40 games for coach Dave Lewis, a solid NHL defenseman in his career, before being traded away. Jurcina was asked if he struggled to understand Lewis' system. "I don't think I was having trouble learning the program in Boston," he said. "The system was good. I just didn't get enough time to show that I could play as well as I think I can. Five minutes a game isn't enough to prove what I can do. A lot of the time I wouldn't get a shift until we were down, 6-1, or something. I don't think you can show what you can do in situations like that. If you're playing under pressure, you can show more." The Capitals have assembled a strong crew of young defensemen, most of them home-grown, and added veteran Tom Poti this season. They're coordinated by assistant coach Jay Leach, whose bench career goes back to 1984 with the University of Maine. Leach has clear ways of doing things and good communication skills, Jurcina said. "He's a great coach. He talks to me at every practice and while we're playing. He's been working with me on my stick positioning and my other stick skills. It's been good for me. In Boston, they were teaching me to lay down in front of shots. Jay doesn't like that. He says if you're laying on the ice, you can't go get the rebounds. He's really smart and he's been showing me good stuff." Milan Jurcina was originally taken by Boston in the 8th round of the 2001 NHL Draft. Defense is a team effort and Jurcina said Washington forwards are doing more to reduce goals-against. "Our forwards are doing a much better job of team defense, coming back to help us out and playing better in the neutral zone," Jurcina said. "Jay Leach is working on that with us. All of our players have improved on the defensive side and you can see that because we're giving up fewer goals." Jurcina played for Slovakia at the 2006 Winter Olympics and is determined to make the team again in 2010 when the Winter Olympics will be held in Vancouver. He's hoping he's got a backer, a former Washington Capitals' star. "I would love to be selected to play on Slovakian national teams. Peter Bondra just retired and I think he's going to be general manager of the national team," Jurcina said. "He's going to be working a lot with team members who are playing overseas in North America so I know he's going to be talking to them a lot. He'll be passing along that information to our head coach in Slovakia. I know Slovakia has another scout watching players on the West Coast and Peter will be based here in Washington." You'll never know the answer if you don't ask the question, but we guessed Jurcina would say Robert Svehla was his hero growing up. 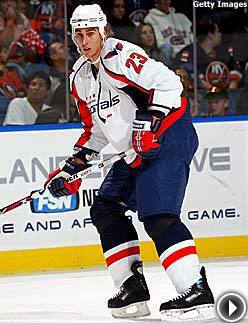 Svehla was one of the first Slovakian NHL stars after the country gained independence. We were forgetting Jurcina had been in North America since he was 17. "Growing up, my hero was Lubomir Sekeras who played for the Dallas Stars," Jurcina said. "He was my idol when I was growing up. My favorite NHL player was Chris Pronger because he's also a big guy and he worked hard to get as good as he is. Svehla was great too. He's an owner of the Dukla Trencin team and their former GM."